Dad is ok. But we had an emotional St. Patrick’s Day. Dad sat down on a pail to take a break while I used my chainsaw to cut some shrubs in the fence row about ten feet away. I was trying to avoid the barb wire, of course, but hit a wire that was embedded in the tall grass. It broke and went flying into his face. I gave him a ride home on the ATV and Mom took him to the local clinic where he received three stitches in his lip and a tetanus shot. Mom took him to McDonald’s after that. He had a shamrock shake. Dad was hurt at 2:30 and was back helping me clear out the fence row by 4. We finished clearing the fence row by 6. A quarter mile of fence cleared in a day and a half, even with an injury timeout. Pictured below are the brace posts. The brace posts are tied together with wire, with a brace between them. This gives you something to pull against when stretching the barb wire. The brace was traditionally placed at an angle. But this results in one post being pushed out of the ground over time. 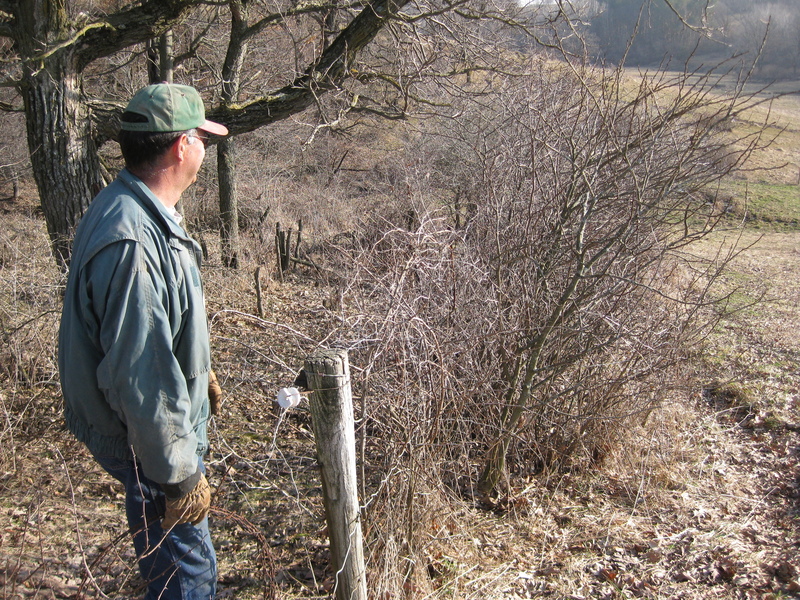 We place our brace level and I will picture this when we make this fence new. This is the old barb wire being rolled up. Our neighbor was rolling up his barb wire on a barrel. 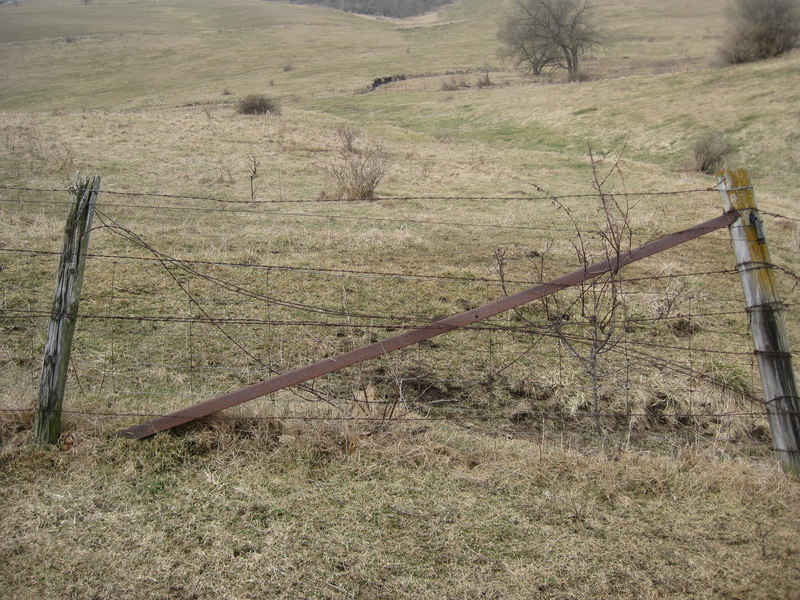 Dad said not many people know how to roll up barb wire. 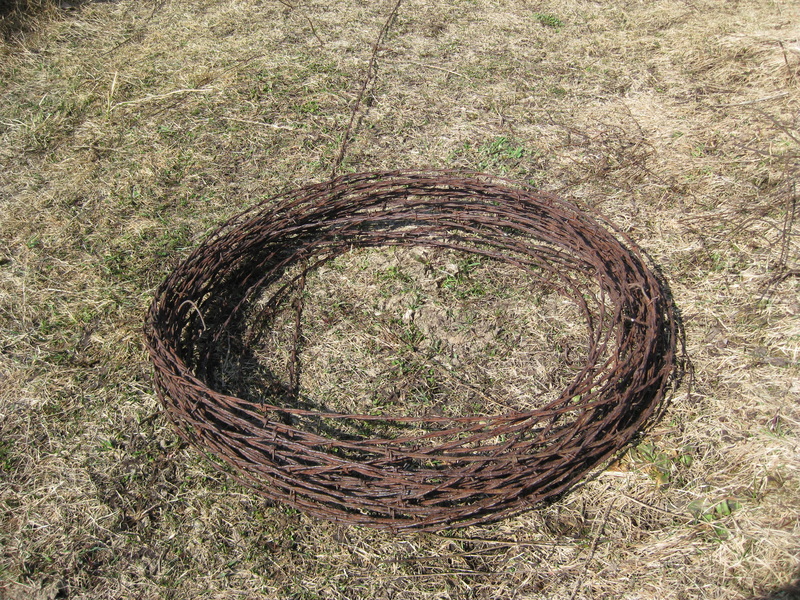 The wire is on the ground and a hoop is formed and rolled along the ground crisscrossing the wire as you roll. It doesn’t seem like rocket science to me; but I benefited from Dad’s teaching. 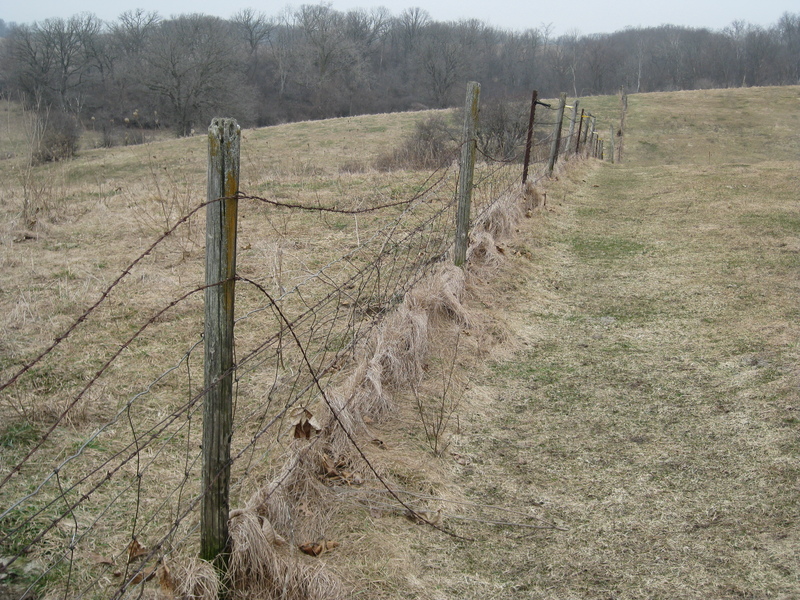 This is the worst stretch of fence because of all the brush that has grown up in it. Dad wasn’t the only one to get hurt. I sprained a tendon in my forearm trying to do too much, too fast. We have been talking about replacing this fence for at least the last three years. It was great to find some beautiful March weather to get after it. Now it’s the first day of spring and it snowed. This will give us a few days to heal until the ground is dry enough to put in the new fence. This entry was posted on Saturday, March 20th, 2010 at 6:51 pm and is filed under Curious cattle. You can follow any responses to this entry through the RSS 2.0 feed. You can leave a response, or trackback from your own site.